Kanseil is a new folk metal band from Italy that has gained my respect with their beautiful demo. They come from Fregona, a municipality of the Province of Treviso in Veneto. It is located at the feet of Cansiglio, a plateau in the northern-Italian Prealps, from which the band took its name (Cansiglio = Canséi or Canséjo in Venetian language). Kanseil were formed in the end of 2010 and soon started playing at local gigs and events, either as a metal band or as an acoustic project. After some line-up changes they entered the studio and recorded their debut demo “Tzimbar Bint” on the end of 2012. “Tzimbar Bint” is a five track demo with a total duration a little over 21 minutes. Except for a short intro, it contains 3 folk black metal tracks and one acoustic folk song. Kanseil play exactly the folk black metal style I like. Guitar riffs following traditional tunes, retaining their black metal roots, combined with acoustic guitars, natural sounding local traditional instruments and various vocal styles. Their production is very good for a demo album and they have a very natural sound, but of course they still need a lot of work. The band uses a wide range of traditional instruments, like pipes, kantele, mouth harp, thin whistles, low whistles and rauschpfeife. Some of these instruments are hand-made by the band members, something that reveals their love for folk music and explains their personal sound. Their music is influenced by central European and Celtic folk music, as well as from the Baltic scene and the result is very interesting. Their vocals vary from black metal screams to clean folk male vocals and narrations, according to each song’s demands and luckily they are very good in all of them, matching the quality of their compositions. The instrumental acoustic song “Dar Bald Hat Geheft Zo Reda (Il Bosco ha Iniziato a Parlare)” is an amazing piece in folk / neofolk style. Actually it’s so good that I am sure Kanseil could easily make a great album in this style exclusively. Not that I prefer it though, since their folk black metal songs are excellent too. They sing both in English and Italian and their lyrics are inspired by the beauty of local nature, history and legends. 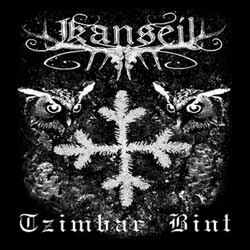 Kanseil is a band that deserves the attention of folk metal fans and definitely of folk metal labels. Their demo includes over 20 minutes of excellent and variable folk black metal and their compositions are much better that many bands with official releases. “Tzimbar Bint” was released by the band in a limited number of CD-Rs, but you can listen to all of their songs in their official Facebook, YouTube and ReverbNation profiles. They are planning to release their debut full-length album in 2014 and I am really looking forward to it.